If you were hooked on HBO's dramedy Looking by the end of its first season, you should be excited for its return, Sunday at 10 p.m. Eastern. The first few episodes of the sophomore season build on the rich character study established last year and have a fresh, playful ease. Of course, you still can't compare the San Francisco-based show to some faster moving fare, like ABC's breakneck How To Get Away With Murder. Looking has maintained the leisurely pace and subtle sensibilities that endeared it to fans of director Andrew Haigh's Weekend — and may have turned off some viewers that gave up on the show before last season's high-water mark, episode five, "Looking For the Future." A bit more unburdened from the early expectations the show faced before its premiere, everything about season two feels more confident. Looking's commitment to its characters continues to bear fruit this year, extending from the excellent chemistry between the show's primary trio — Patrick (Jonathan Groff), Agustin (Frankie J. Alvarez) and Dom (Murray Bartlett) — to stand-out secondary characters like Doris (Lauren Weedman) and new addition Eddie (Daniel Franzese). We spoke to Looking creator Michael Lannan about working on the show and what to expect from season two. Towleroad: There’s been an overwhelming amount of response to the show since it was first announced. What’s surprised you most about the reaction the show’s received? Michael Lannan: I think it’s been really awesome and surprising to see how many people have written about it. There’s been such an incredible positive reaction that it resonated with people. I think there were many people who didn't like the show who also wrote about it, and that’s awesome too, because the worst is people not having any opinion about you. It’s been really awesome. It feels like we touched on something that’s very personal to a lot of people. One of our executives at HBO was like, 'Wow, people really take this show personally in a way that most shows aren’t taken,' which I think is really exciting. It feels like we’ve touched on something that matters and is sensitive to people, and that’s cool. I love that. TR: Why do you think that is? Why do you think people are taking the show so personally? ML: I think any time there’s gay content or content with gay characters in it, everyone has certain ideas about representation, and they want to see themselves in it. I think it's awesome when people do that. Our goal was just to tell really good stories with characters we liked and found interesting. A lot of that personal nature comes from people wanting to see how it compares to their own lives and what resonates with them and what doesn’t. TR: You mentioned some of the folks who wrote about the show and maybe weren’t as warm to it in the beginning. I feel like there was a turning point midway through the season where, myself included, people started to understand and appreciate the pacing and momentum of the show. Were you anticipating that reaction? How intentional was that pacing? ML: I think that was something we planned. We wanted a show that didn’t move super quickly, that felt like it was an everyday kind of show, we were moving through these characters with their lives. We weren’t going to just dash through everything really quickly and set up these huge, exciting, flashy stories. We always wanted the language of this show to reflect a certain sensibility that we like. A lot of the style is sort of related to Andrew's film Weekend, and playing off that feeling of an intimate world, one that unfolds for those that are patient and who sink into the story. That was always a goal of ours to have it build in that way. Also, any show requires a certain number of episodes to care. Even things like Game Of Thrones take a season to be really invested in it. It was really great to see how people started to understand the language. I think it was around episode five, Richie’s and Patricks’s date, that people really sort of clicked in and understood what the show was and the perspective of the show. 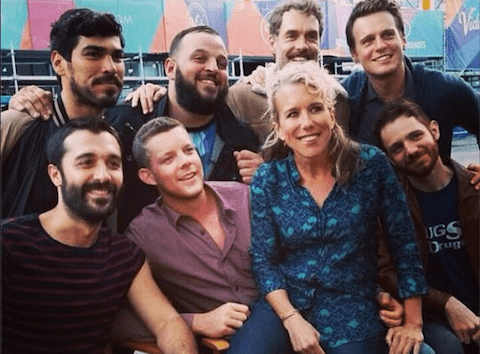 TR: This season, Russell Tovey, Lauren Weedman and Raúl Castillo all got bumped up to series regulars. What are you most excited to explore with those characters? ML: The different relationship Patrick has with Kevin as compared to Richie is really awesome and exciting. I can’t wait for people to see that. I think Doris has a great season. We get to go deeper with her and find out who she is beyond the funny friend. Lauren is fantastic, and I think people will be really surprised and excited to see what a soulful actress she is and how much more she has than just being hilarious — and she is in fact incredibly hilarious still — but she’s got a lot in there. TR: I love her. I feel like I first saw her work on Hung, and it’s such a contrast to see her in this role. Doris definitely has a bit of a following. ML: We had a screening at the Castro Theatre for our premiere a couple of nights ago. People were going crazy for her. She would come on screen, and people would start laughing before she even said anything. She would say some of her lines, and people would laugh so hard that you couldn’t hear the rest of the conversation until she said something again. It was amazing. And actually, when Raúl came back on screen, Richie, there was an audible gasp and cheer. There was this group of people that stood up and started cheering when Richie appeared. It’s so great when people know the characters, and they’re just anticipating and waiting for them to come back on. They don’t have to get to know them, they’re just excited to be back with their friends or however they see them. TR: Love triangles are something that pop up a lot in stories. What was your approach to creating a love triangle? ML: I mean we didn’t want to do something very typical and, ‘Which one is he going to pick?' so we sort of focused on going deep in those relationships on their own. It's more about Patrick and Kevin and what they understand about each other and what they don’t understand about each other and their conflict there within that. On the other side, how are Richie and Patrick feeling about each other after what happened in the first season? It’s not quite so much about playing off each other and the jealousy. It’s really about Patrick and his emotional world and just what those people activate in him and what choices he makes based on that emotional life. Love triangles are a classic way to talk about a character’s emotional world and the choices they make. We really tried to focus on going deep with Kevin and then going deep with Richie, and what does that mean to Patrick, not about the jealousy and the rivalry. 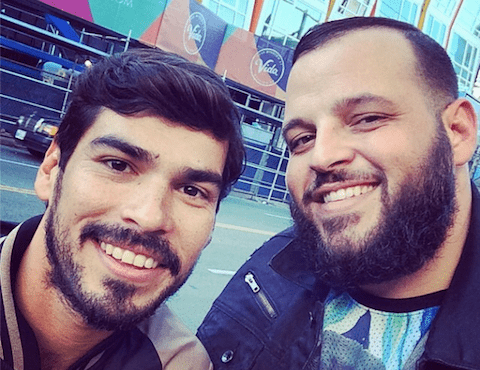 TR: Also, you added Daniel Franzese as Eddie this season. What has he brought to the cast? ML: Magic, fun, joy, specialness. We love him so much. We love Danny the person, and he’s fantastic in the season. He has like two scenes in the first episode, and, I swear to God, everyone I know is talking about him. They just adore him, he’s very special. He’s great with Agustin. He brings out a side of Agustin that we haven’t seen before. He’s very joyful. He’s very generous, and at the same time you feel that there are some complicated things there under the surface. It’s a whole new shade to the world that we haven’t quite seen and a really fun, interesting one. TR: Do you have a favorite moment from season one? ML: The first one that comes to mind is I just love the first scene of the series. I know that's kind of cheesy. Patrick's in the woods trying to be sexually adventurous and then failing and then walking back out into this very modern San Francisco with all its technology and its Grindr and its friendships and its video game jobs. I just love the way Jonathan is in that scene and the launch into the world. I love Dom and Lynn meeting in the bathhouse. I love the way they relate to each other and flirt with each other and the way Dom walks out with another guy, but clearly there’s this connection between them. I love in episode five the way that Richie and Patrick learn about each other. In particular, I love the scene when they decide not to know what’s going to happen between them when they’re waiting at the señora’s house. They choose to walk away and experience it themselves, instead of having someone tell them what it’s going to be about. TR: As the creator of this world, what surprised you most about the way the show has evolved and blossomed? ML: It’s been really pleasing to find an emotional depth in the show, and I think Andrew brings a lot of that with him. He’s always so interested in what’s going on below the surface and going deeper with the emotional content. I think Jonathan is so wonderful, he is so skilled. I don't think people know how good he is, because he’s so effortless, and he makes it all look so natural. Jonathan can provide these fun, awkward, light, cheerful moments, and then he can give that emotional depth as well. Those are some of my favorite things that I couldn’t have predicted that I think have developed in the show. TR: What do you hope viewers take away at the end of season two? ML: I hope that viewers will have seen a lot of different sides of the characters that they didn't get to see in season one. I think everyone shows a different color. A lot of them are quite surprising and add depth to these characters. I hope people feel that too, and feel the world deepen. 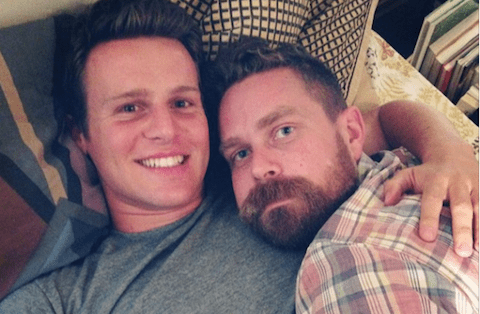 For more from Michael Lannan, check out our weekly season two 'Looking' recaps every Monday.